Once considered a luxury, in-flight Wi-Fi connectivity is becoming the new standard worldwide. As more and more airlines seek new opportunities to generate a loyal consumer base, attract new customers and ensure profitability, the industry has seen an important uptick in the number of carriers offering in-flight connectivity on both domestic and international flights, as a way to generate incremental revenue and gain valuable insight into passengers. An increase in the number of low-cost carriers, an improving economy and a higher number of available routes worldwide are all contributing to a surge of new passengers on a global basis; according to IATA, an additional 421 million passengers will travel in 2019, and in Latin America alone, airline traffic saw an increase of 7.3% in 2017. Airlines are looking to capitalize on that growth by offering a better experience to passengers, and experts highlight the growing importance of in-flight connectivity in providing that experience as passengers travel more frequently and across longer distances. As a result, by 2027 the number of connected commercial aircraft in Latin America is expected to grow from 297 in 2018 to 1,518, and in North America from 5,053 in 2018 to 6,402, according to Euroconsult. 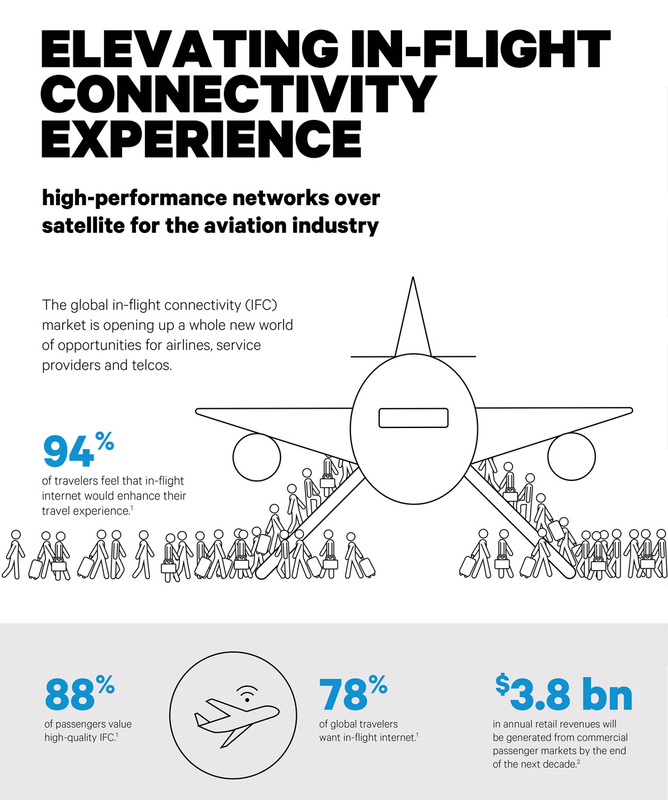 In-flight connectivity also represents a significant untapped revenue stream for airlines. A recent study by Euroconsult predicted that by 2027, in-flight connectivity retail revenue will grow from $35 million to $291 million in Latin America, and from $984 million today to $2,4 billion in North America. The connected aircraft can benefit airlines’ passenger engagement strategies as well. In a recent survey by Radius Global Market Research, 50% of business travelers indicated that they would prefer less human interaction while traveling. The survey also showed a strong partiality towards airlines with in-flight connectivity and the use of airline mobile apps. These results and the worldwide tendency towards automation, increases the opportunities for airlines to interact with their passengers digitally. In-flight connectivity, especially linked to a proprietary mobile app, creates new opportunities to up-sell and cross-sell a wide portfolio of products and service including duty free items, last-minute hotel bookings and car rentals. Airlines are also profiting from the rich data generated from in-flight connectivity by mining the information for new insights into their ever-changing consumer base. Understanding user navigation patterns and ecommerce trends can lead to the inception of new revenue-generating opportunities. Furthermore, in-flight surveys prompted upon connection can be used to glean information on current levels of customer satisfaction and to gather even more marketable insights. While there are still a vast number of airlines that don’t offer in-flight connectivity, passengers are questioning why this isn’t a basic service they can purchase on any carrier, prompting the sudden increase in airlines that offer the service or are seeking to provide the service in the near future. Many of these airlines are also realizing the vast sources of untapped revenue and information that they are neglecting by not offering in-flight connectivity. As a result, the competitive landscape in the airline industry will surely change, leaving disconnected airlines to wonder how they will ever catch up. 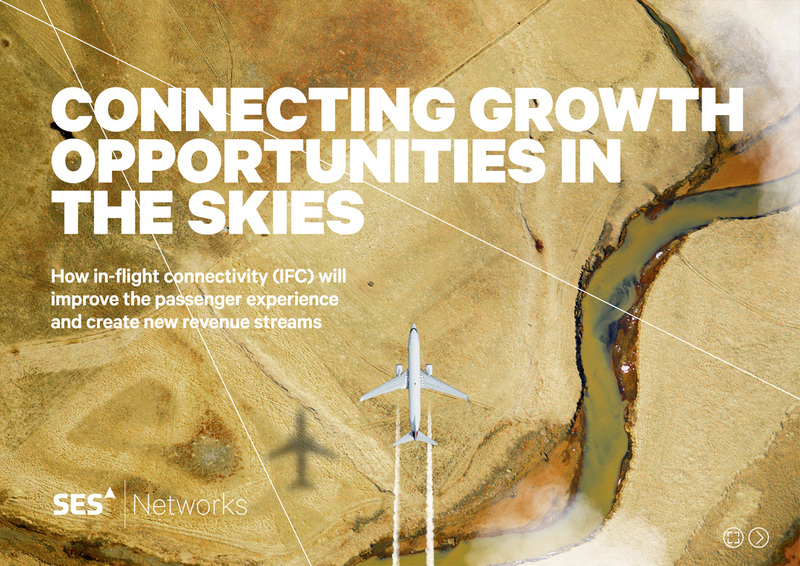 Companies like SES Networks continue to work closely with telecom companies and IFC service providers to provide multi-layered and future-proof connectivity that is tailored to each airline and travel route.